Ricoh is set to introduce an update to its GRD range of compact cameras with the launch of the GRD IV. Ricoh claims the camera features improved autofocus speed and accuracy thanks to the hybrid AF system, which uses an external AF sensor as well as the contrast AF from the CCD sensor. The GRD IV also includes a new 3in, 1.23-million-dot LCD, which adds white pixel dots to improve brightness. Alongside the 10-million-pixel, 1/1.17in CCD sensor, there is a new GR Engine IV processor unit that Ricoh says will achieve reduced colour noise and improved colour reproduction at high sensitivities. The noise is now processed with the data in its raw state before downsizing for the JPEG. The lens remains a 28mm (equivalent) f/1.9 and now has image sensor-shift stabilisation for up to 3.2EV. Mr Kobayashi, marketing manager for Ricoh?s planning office in Japan, told AP: ?The lens barrel has a new construction to make it quicker and more accurate?. Shooting modes have been bolstered with the addition of Bleach bypass, positive film and multiple exposure and bulb modes, while the internal composite is designed to combine images for star-trail shots. A new electronic level offers both tilt and roll monitoring to help ensure a level shot. The GRD IV will be released in its signature black, although the grip can be replaced for either a wood grain, leather or carbon model by a Ricoh service centre. 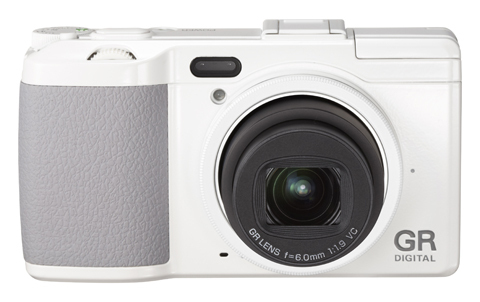 A limited-edition white version will also be made available along with a metal lens cap. The camera is due on sale in October, with final pricing still to be confirmed.